Our new recruitment chair, Jereme Sebastian, led us to our second consecutive semester as the top recruiting fraternity with 11 new members. 6 of the 11 recruited are also playing football here at Missouri State. The recruits are now going through their pledge education, led by brother Eric Delaney, with their new member retreat taking place the weekend of 2/15/13. 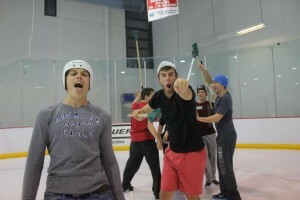 Our first brotherhood event of the semester was an intense game of broomball at Mediacom Ice Rink. 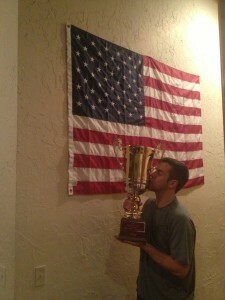 This was just the first of many planned competitions set up by newly appointed brotherhood chair Austin Sherman. Upcoming events will have the chapter split into 6 families, each named after one of our fraternity’s founders, competing against each other for points and pride. Other upcoming events include paintballing, movie nights, and pledge class retreats. Our athletics are looking very solid this semester. 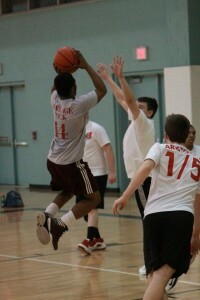 Our basketball team has an undefeated record at 3-0, showing complete dominance in each game. Our futsal season ended early with a 2-2 record, but we showed promising performances and are looking forward for the soccer season to begin. We started off this year’s community service with a bang, taking home the “Bloody Cup” after having the highest percent of members donate blood to the Community Blood Center of the Ozarks. 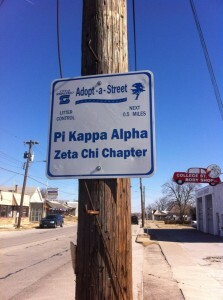 We have also adopted a half mile stretch of College Street. 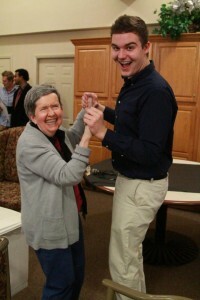 Also, we have partnered with several sororities doing community service at a local retirement home, The Gardens. Other special events planned for this semester include Mom’s Weekend on May 4th when we will be taking the chapter’s mothers out for lunch and then to a Springfield Cardinals game. Another exciting event is our first formal since returning to campus. The formal is planned to be the weekend of April 5th at the Lake of the Ozarks. Events planned for this formal include an award ceremony, a dinner cruise, as well as a dance. This entry was posted on Friday, March 22nd, 2013 at 7:29 pm	and is filed under Chapter News. You can follow any responses to this entry through the RSS 2.0 feed. Both comments and pings are currently closed.